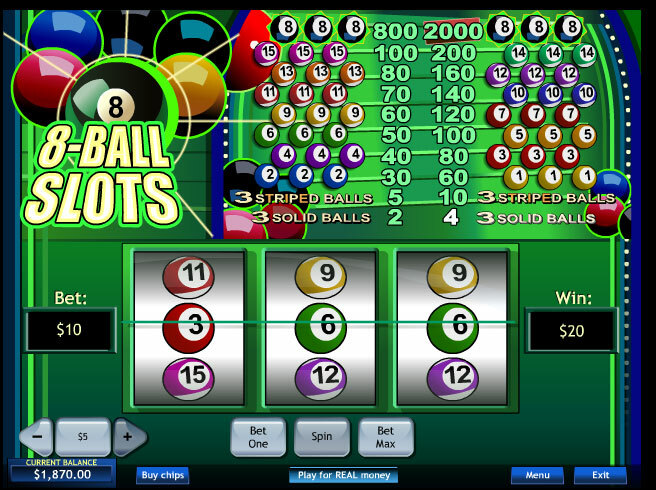 8 Ball slots is an amazing classic slots game, from the creators of the best online slots games – PlayTech. As it has been released in the late September of 2006 the game is a bit old, but don’t let the game’s age disturb you, because you are going to have a heck of a good time playing it. It has 3 reels and 1 payline, which is the basic concept of a classic slots game. But with 20 winning combinations, a big generous jackpot of 2000 coins and a second jackpot of 800 coins, I would say you are in for the big win. The coin sizes you can actually bet are varying from $0.05 to $5.00, which is a very wide variety for this type of online slots games. However you can bet up to a maximum amount of 2 coins, which is a bit of a letdown, since you have such a good variety of coins to choose from. The theme of the game is pool, and as you may have assumed all the symbols on the reel-machine are actual billiard balls. Overall the game has good design and style and gives you great chances of winning big. I would definitely recommend it.